Lenny Kravitz has been grilled about why his relationship with Nicole Kidman didn't last. The rocker was asked the curly question by a fan on US TV show, Watch What Happens Live. "Some things just don't work, but the wonderful thing is that we're all friends," he said. Kravitz was also asked how he felt about his daughter, Zoe, working with his ex on the hit series, Big Little Lies. "I thought it was very interesting that they ended up on the same show," the singer told the fan who was on the phone. "And Zoë hadn't seen Nicole since she was younger, so it was beautiful that they got to know each other as adults and make this great show together." Kravitz and Kidman started dating in 2002, a couple of years after the Moulin Rouge star divorced Tom Cruise. Kidman made headlines last year when she let slip that she and Kravitz were secretly engaged, while talking about Zoe. "I knew Zoe because I was engaged to her father. It's all in the family," she said. "I love Lenny, he's a great guy." Kidman had said she was engaged once between her 2000 divorce from Tom Cruise and her 2006 marriage to Keith Urban but never revealed who it was until last year. "It just wasn't right," she told Vanity Fair in 2007 of the secret engagement, without revealing her former fiance. "I wasn't ready. We weren't ready." 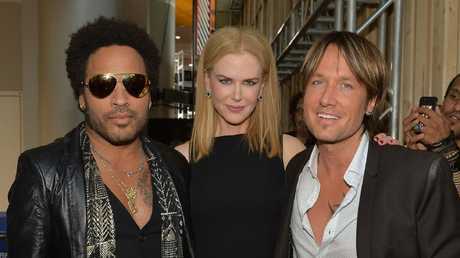 Lenny Kravitz, Nicole Kidman and Keith Urban at the 2013 CMT Music awards. Zoe Kravitz has said that she was fond of Kidman and that she used to live with the Australian and her dad when she was a teenager. "I hadn't seen her in a long time before Big Little Lies, but there was a point where we were all kind of living together. I was about 13, and she would take me to see movies; she was so nice to me," she said. Kidman and Kravitz will both return for the second season of Big Little Lies which was filmed this year and will air in 2019. Meryl Streep is set to appear in the second season of Big Little Lies.